I was challenged today as I prepared for my weekly "FreeStyle Friday Show" . As I was preparing my mic and checking the music that I was going to play, a young man approached me and asked what type of music I was listening to. I explained that I was preparing to broadcast my show as I untangled myself from all the wires. He Took an immediate interest and asked if I do interviews. I said sure and welcomed him to come over and join the show, and what a show it was. Hell no, I jumped in and had a good interview and discussion. The show might turn some heads and scare some people, but it is a big world and I am going to run into a lot of different things, and have run into some different things. So I challenge my listeners to get through your fear and checkout the interview. why is the world scared of your faith? what are some of the connection between wicca and other faiths? Do wiccans believe in hell? Give some examples of a wiccan ritual. what is shamanism and how does it connect with Wicca? Why were there witch hunts? 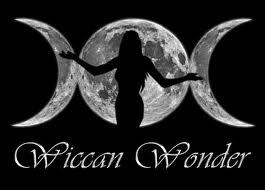 Here is direct link "Interview with a Wiccan"